Then I was ready to buck up. To be mature. To be an adult. Then I honed in on this panel. Hahahahahahahaha. Ok, seriously, I’m ready to review these comics. Right, Lying Cat? Ok, yeah. I’m lying. 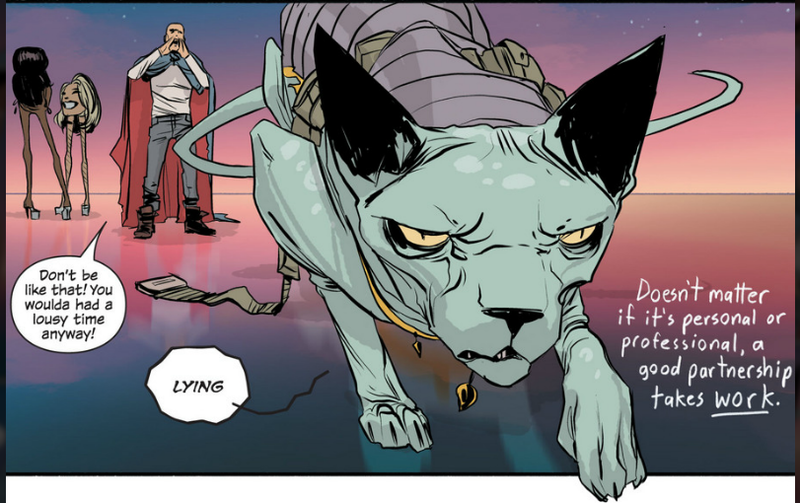 I’m totally not ready to talk about the latest issues of Saga that I’ve checked out, but I’m curious, any of my readers checking this out? If so, drop some thoughts below, and I’ll talk about them when I ACTUALLY talk about these two issues. Fricken love this series! Best book i’m reading. I’m also enjoying Manhattan Projects and Revival from Image. Thanks! I’m really enjoying Manhattan Projects too, but need to catch up. I’ll have to check out Revival!